so. i’m having issues. 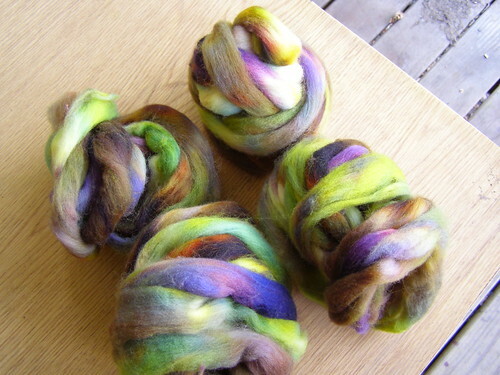 i kept 2 4 oz braids of the first fiber club offering – croci – for myself. and i spun it. looks like aran weight but knits best on 10.5 US needles – 424 yds and 4 sts/in. and now i want to make myself something out of it. i’m rather used to 4 oz skeins – and i know what to do with them – socks. hats. mitts/mittens. baby stuff. but what to do with the 8 oz. that is not a scarf or child/baby sweaterage? it’s a bit of a conundrum. i feel like there just aren’t that many middle sized things to knit. if a make a project that is too small, i’ll have a bunch left over. i think i’d rather add another yarn to it and make something. 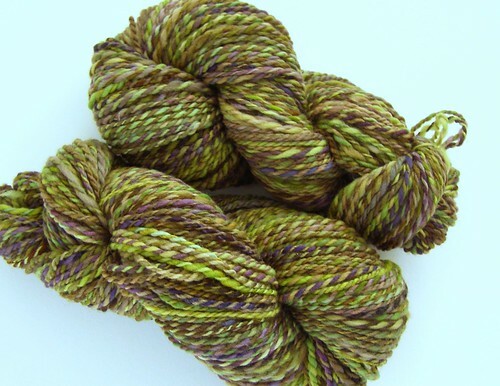 what would you do with 8 oz of handspun? p.s. i’ve started a sweater with it plus another yarn. we’ll see! p.p.s. there’s still one spot in the farm wool fiber club – information over here. This entry was posted in cosyknitsliterally, cosyspins, fiber club, handspun, knitting, spinning by cosymakes. Bookmark the permalink. My vote is for a shrug. A short sleeved, bolero-type shrug. The color is lovely. I was thinking the same, …A shrug, it was my first thought ! Would be beautiful !! your p.s. was going to be my suggestion! the yoke to a sweater where the body of the sweater is a different yarn. i think that is what i’m going to do with mine. it can’t wait to see how yours turns out! hahaha :) you must be a bag knitter… or a bag lover or both. You could make a matching set of something – hat, mitts, and cowl. Or a nice long scarf. They’re all good things. would 8oz be enough to make one of those deep blue citron scarves that you made? Not sure if that was the color or name of the scarf… i just love it. 8 oz would make a BIG citron, actually. i think this stuff might be a bit bulky for such an adventure though. the last citron was made with 4 oz. blanket. baby blanket, lap blanket. you’re like a mind reader… but alas. i already have a handspun one of those in the works! hahaha :D pet yarn! everyone needs some yarn pets.